1. Click the ‘Alerts’ icon in the information box. 2. The Alerts window will open, which will allow you to create alerts. 4. Select which devices to apply the alert to by clicking the ‘Add Devices’ button. There, you can select which devices by ticking the check box next to the appropriate device. Click the ‘Save’ button at the bottom of the window to finish adding devices. 5. 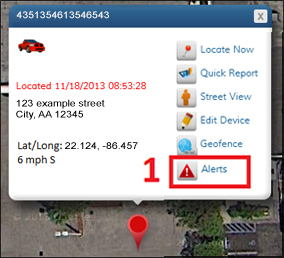 Select which type of alert to set up from the ‘Alert Type’ drop-down box. Fill in the fields; each alert requires different fields. 6. Alerts can be sent via email or SMS to your cell phone. To send the alert via email, fill in the ‘Email’ field and tick the accompanying ‘Use’ checkbox. Then, click the ‘Add Contact’ button. To send the alert via SMS, enter your phone number in the ‘Phone’ field. Then, select your carrier from the drop-down box and tick the ‘Use’ checkbox. Then, click the ‘Add Contact’ button. 7. Click the ‘Save’ button and your alert is now active. This entry was posted in Alerts on March 17, 2014 by .